Potato is a versatile vegetable that adds flavor and taste into any dish it is added to. I like potatoes and have shared plenty of recipes with potato in this blog. 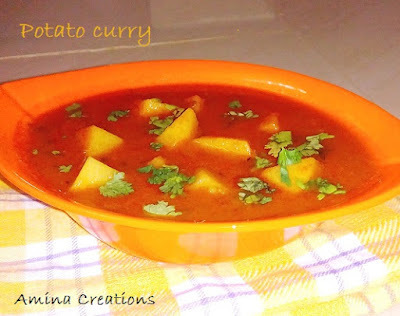 And today’s recipe is of a quick and easy potato curry that is flavourful, delicious and goes well with chapati, paratha, pashte or dosa. Heat oil in a non stick pan; add onions, cumin seeds and cinnamon stick and sauté for a few minutes till the onions turn golden brown. Add ginger and garlic paste and sauté for a few seconds till the raw smell goes. Now add red chilli powder, coriander powder, turmeric powder and salt and mix well. Add kasuri methi and the tomato puree and mix well. Continue cooking for 5 to 10 minutes in medium flame till oil starts separating and the raw smell of tomatoes has gone. Add the potatoes, garam masala powder and coriander leaves along with 2 to 3 cups of water and mix well. Bring the curry to a boil, then reduce heat and close a lid. Cook for 10 to 15 minutes till the potatoes are cooked. Add lemon juice and boil for a minute. Check for taste. Add salt or chilli powder if necessary. Adjust the thickness of the curry according to your preference. Transfer to a serving bowl and garnish with some coriander leaves. 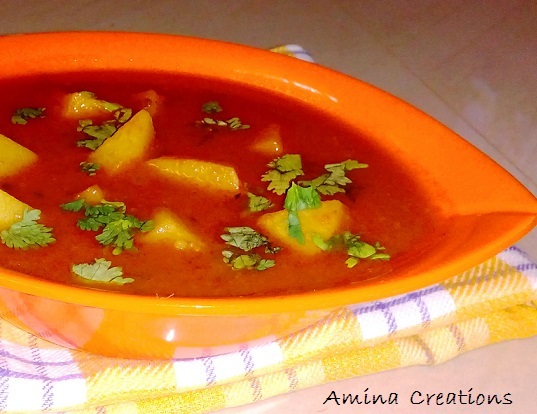 Potato curry is very common and popular in Bengal, next time will try this recipe.